Day 18, being a Saturday, is a bonus day. Normally we would not have had anyone on site. However, Craig asked if it would be OK to work and, of course, we said yes. He was here for most of the day and the following photos show the results of his efforts. 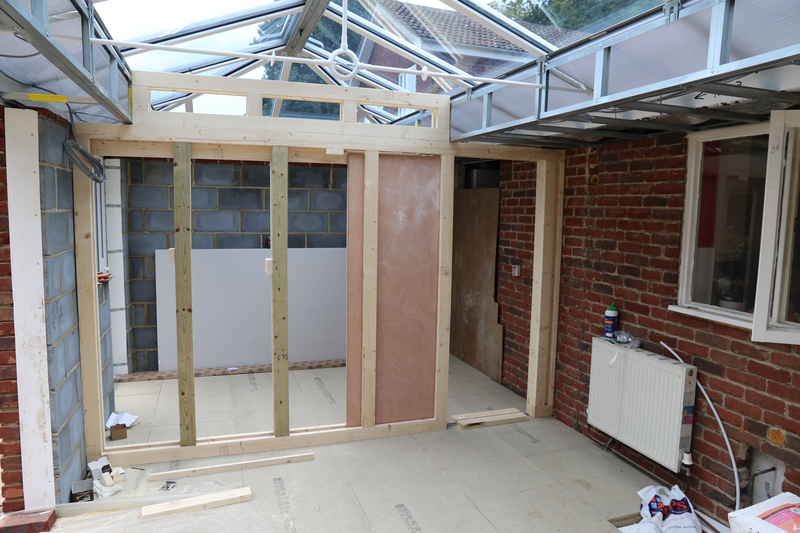 We now have the framework in place for the stud wall which will separate the utility room from the rest of the conservatory. In the background can be seen some of the sheets of plasterboard which will be installed starting Monday. We also have the “hidey – slidey” door installed although not fully functional. Full operation will only be possible after the plaster work is completed and floor tiles laid. At the moment there are two wooden blocks in place to prevent damage to the track which will be subsurface once the tiles are in place. Note the stud wall does not reach to the apex of the roof. The stud only goes high enough to continue the same line as the plaster board for the perimeter ceiling. There will be a glazed insert installed atop the stud wall to allow light to pass thru whilst keeping out any noise from the washing machine and tumble dryer in the utility area. 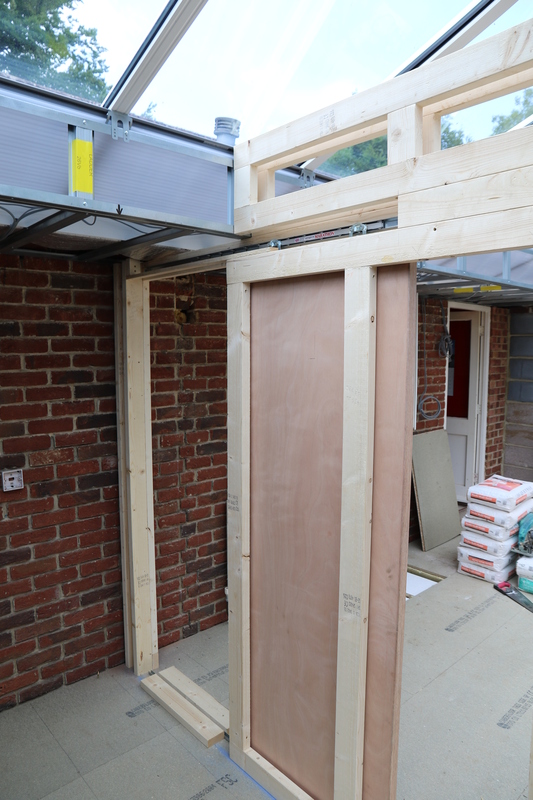 Can’t wait for Monday as there is a hint that the bi-fold doors will be installed which will then make the whole structure truly weather proof. This entry was posted in Local (To Me !!!) and tagged conservatory, Executive Windows, plaster, plaster board, sliding door, stud wall. Bookmark the permalink.